The 1977 tour of America had given rise to a revival in the fortunes of the group. They were playing great, the on stage spectacle had reached new heights and plans for a new album to be recorded after the tour were in place. 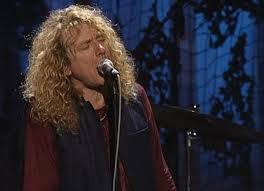 The tour would subsequently be cancelled amidst backstage violence in Oakland and then the shocking news of the passing of Robert Plant’s five year old son Karac. They were difficult days and Jimmy was at pains to explain that they would not be splitting and that Robert would work with the band again. Slowly they did pick up the pieces – though not before Robert had notions of giving it all up to go into teaching. With much support from John Bonham, he agreed to a group rehearsal at Clearwell Castle in May of 1978. As for me, with Zep off the road, I was busy with one or two other matters – for instance leaping up on stage at The Who filming in Shepperton. My summer was taken up writing and researching a major Zep ten years retrospective for Sounds music weekly. 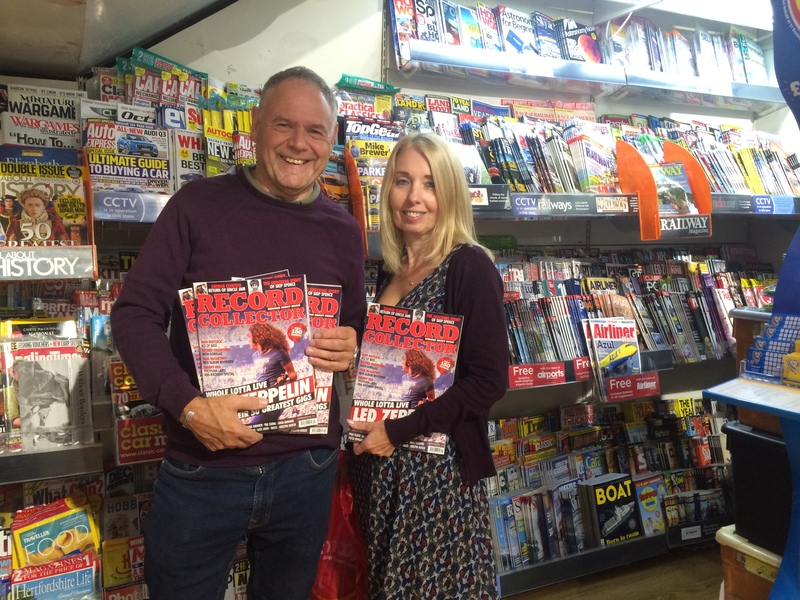 Working with Geoff Barton, it was a big thrill to see my work in print. 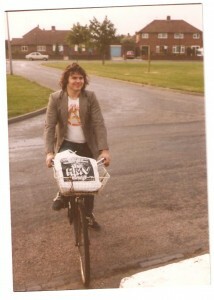 The reaction spurred me on to move ahead with a long held idea to produce a Led Zeppelin fanzine. Built on the do it yourself ethics of the punk fanzines of the day such as Sniffin Glue and Ripped And Torn, I began hand writing what would become the first issue. In the autumn rumours were rife that the group had resumed rehearsals at Ezyhire Studios in North London. The opportunity arose for me to hear what plans the group had ahead from one of the principal players. On November 4 1978 Robert took part in the annual Goaldiggers Charity Five-a- side football tournament at Wembley Arena. I made it my mission to attend and wizzed over to the Wembley Empire Pool after playing soccer in the morning. I searched Robert out by the sidelines area and spent a memorable afternoon chatting to him and wife Maureen. Robert was more than amiable – laughing at the antics of the Page 3 ladies team and informing me that they were about to head for Stockholm to record a new album at Abba’s Polar studios. I came back from that encounter totally invigorated. This pic was taken by me on that afternoon. By early 1979 two things had happened. Led Zeppelin had a new album in the can (rumoured in some circles to be titled Look) and I had produced the first issue of Tight But Loose and it was already creating a platform of communication of like minded Zep fans. Of course in true Zep style there followed a period of waiting..and more waiting..
Just as I was reporting in the second issue of TBL that there was no news of the album or any live shows, they surprised us all by announcing a comeback at Knebworth. It was the summer of Led Zep 1979 and what a summer it turned out to be. Before we go any further one thing needs to be stated. 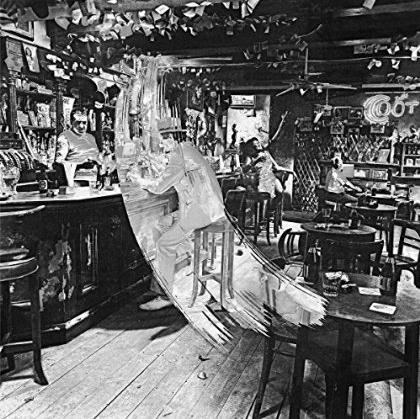 The eighth Led Zeppelin album In Through The Out Door is intrinsically lined with those two Knebworth appearances. Listening to it in my bedroom remains one of the most memorable playbacks of my life. The next challenge was to acquire the six differing covers to the album. 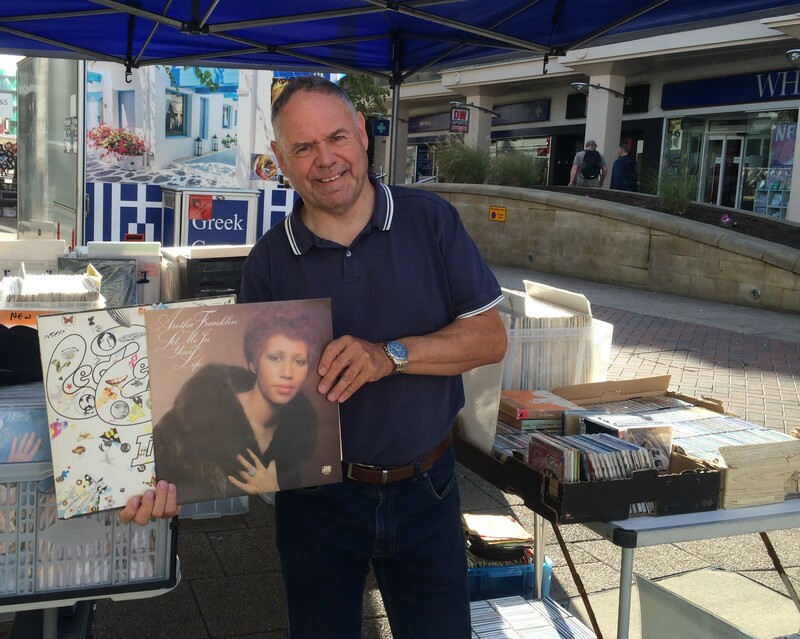 The problem was that as the sleeves were pre packaged with the distinct brown paper bag, the purchaser therefore would not know which cover he had invested in until the album had been bought. Luckily I worked for a record shop -on Monday August 20 I duly waded through a fair few copies of the album unsealing them and sealing them back up until I had been through about a 100 to narrow down the six sleeves. Mission accomplished. 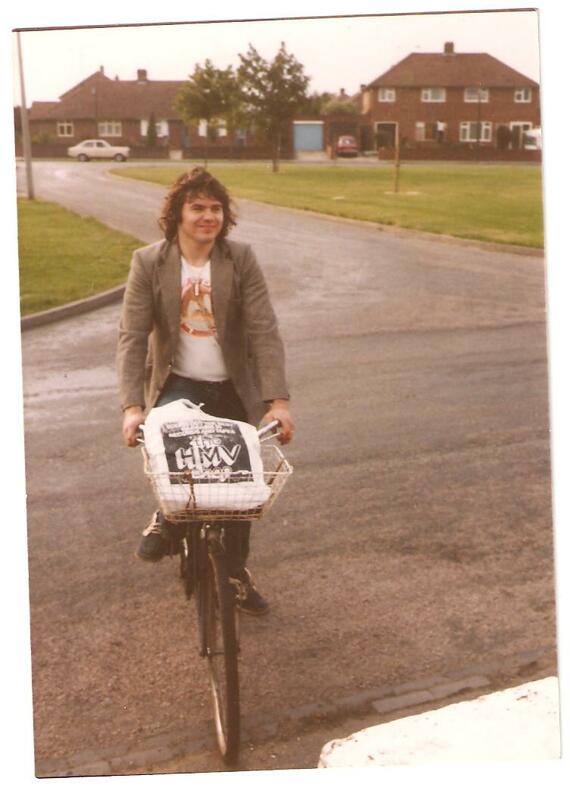 This pic shows me on my bike outside Dec’s house on the afternoon of Monday August 20 – the HMV bag contained my six LP’s as purchased from WH Smith where I worked. The press reaction to the album was unsurprisingly somewhat mixed. The next six months contained many an Out Door thrill. Hearing the Radio One UK chart run down where it was announced that the album ahd entered the Uk chart at number one (fending off Bob Dylan’s Slow Train Coming in the process)…the US reports of the sales of the album being a saviour to the US record industry – as all Zep albums went back on the Billboard chart…collecting the various configurations of the single Fool In the Rain/Hot Dog. On November 28, I was also lucky enough to attend the Melody Maker Poll Awards at London’s Waldorf Hotel. 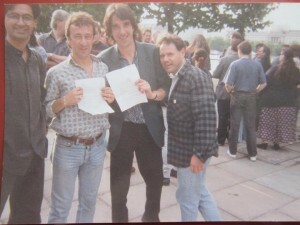 Robert, Bonzo and Jonesy plus Peter Grant, Richard Cole and various Swan Song personnel attended. They received awards for Best Band, Best Live Act, Best Album, Best Male Singer, Best Guitarist, Best Producer and Best Composers. 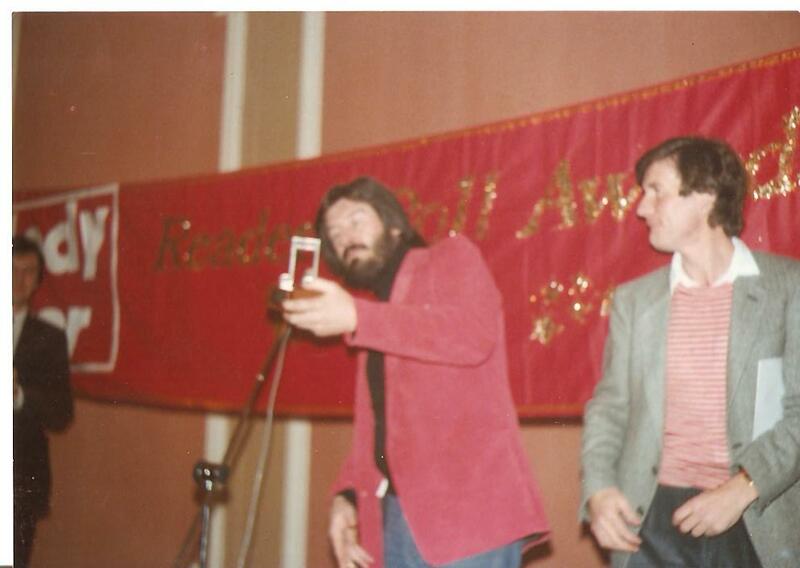 John Bonham can be seen in this pic accepting one of the awards from Monty Python’s Michael Palin. Then there was the incredibly exciting Over Europe tour the following summer where All My Love was a welcome addition to the set list – a final approval of it being one of the pivotal tracks on the album. I vividly remember being at the side of the stage at the Frankfurt Festhalle a few feet from Robert as he sang this emotional song with such passion. I’d spoken to John Bonham a few times during the Over Europe tour – and on our last night in Munich as we all revelled in a night club, John wrote down his phone number and told me to call him when we got back in the UK (That piece of paper written on a German hotel note pad page with his name and number on remains one of my most treasured possessions). I remember vividly him giving us an affectionate big bear hug as we left the club that night. On Thursday July 24, I phoned him at Cutnall Green. We had a long conversation. John was very happy with the way the Europe tour had gone and was now looking forward to a holiday. He told me there was a group meeting due the next day to discuss what was to happen next. He said to call during August for more news. During that second call in late August, John strongly hinted they would be returning to America in the autumn. When the first dates were announced in early September I’d already made up my mind to go. I was planning on the Landover/Philadelphia dates. I was constantly in touch with Swan Song that month and on Thursday September 18 I visited the office to take in some early text of the forthcoming Tight But Loose issue. Jimmy Page was at the office that day and I spent over half and hour with him one on one in the inner sanctum of their plush interview room. He talked enthusiastically of their plans and showed me a model set up of their new lighting and stage rig. The model was complete with a miniature representation of each of them on stage. I asked him about the ongoing chronological live project and he told me he had been looking at some footage to go with the tracks. He also said that the outtakes from the last album were still under consideration to use in some format. An album and UK dates in 1981 were also planned. The following Tuesday I phoned Unity at Swan Song for the latest news. Unity informed me they were commencing rehearsals in Bray Studios later in the week. Excitedly I took down notes on a piece of paper as she told me all this. I still have that note – a reminder of the optimism of that time. Unity told me there may be a possibility for me to attend rehearsals the next Tuesday. Now that would be something very special. Tight But Loose 5 was to be an Over Europe special with a 10,000 word report of the tour formulated from the five gigs I’d witnessed. I’d been working on it fairly non stop since August and it was nearly complete. I spent the next two days finishing up the lay out – these were the days when I cut it all in myself scrapbook style to be printed. On Thursday September 25th (with huge irony) I finalised the opening editorial which I’d written on September 22th – it was the last piece of the magazine. It was already to go. I was ecstatic and with good reason. The mag was ready to print, there was a chance I may even get to see them in rehearsal the next week and America beckoned in October. Much has been said over the years about the less than crystal clear mix – this certainly does sound sprightlier though not radically so. In The Evening still retains that feeling of rebith so evident at Knebworth. South Bound Suarez is another of those hidden gems – much more to this track than first meets the ears. Fool In The Rain is a magnificent Bonham masterclass -marvel at the tympani drumming during the break and the way he comes back in for the final chorus. Jimmy’s solo is so off the wall. This is the Zep of new places to go and going there with renewed confidence. Hot Dog sounds surprisingly fresh and would have made a great UK single had that been the game. Carouselambra intrigues with it’s JPJ led dream machine keyboard effects. The vocal do sound slightly more upfront. I still have great affinity for All My Love. The right song at the right time and Jonesy’s solo is prime JPJ. I’m Gonna Crawl – another revelation – the interplay of all four here is just mesmerising. Some forceful Bonham sparring with Page brings a typical dynamic quality to the proceedings, while Jimmy is at his bluesy best on the solo. A pleading Plant vocal that peaks at 4 minutes 41 with the most angst of screams brings the track to a satisfying finale. So to the Companion Disc. This very welcomed reissue puts In Through The Out Door right back in the spotlight. Sprightly and full of vitality -still with new ideas and musical themes to elaborate upon. Far from the so called tired finale, it’s an album that has solid foundations to point to a whole new era…with much to enjoy, and I have certainly enjoyed revisiting it all these past few days. 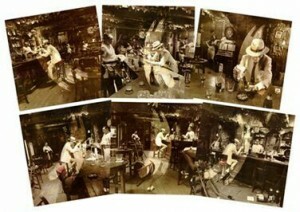 Only 4,000 Japanese copies of Led Zeppelin’s fiftieth anniversary photo book will be released. The Japanese edition will come in an alternate red cover and will be released on November 20. 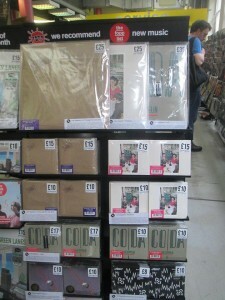 Led Zeppelin is currently featured on the cover of Record Collector Magazine. The cover feature of the magazine is on Led Zeppelin’s 50 greatest gigs. Two new interviews help to explain how Led Zeppelin’s music was used in the TV series “Sharp Objects.” The show’s music supervisor spoke to Business Insider, and the director spoke to Variety. A guitar signed by Robert Plant and other musicians was auctioned for charity. It sold for $80,000. October 2 – The official Led Zeppelin photo book will be released. 24 years ago this week, Jimmy Page and Robert Plant reunited for two performances filmed by MTV at the London TV Studios for their Unplugged series. Appropriately dubbed Unledded, this saw the pair roll back the years with an inspiring re-evaluation of the Led Zeppelin catalogue. I was lucky enough to attend both days filming – indeed I was involved in supplying the TBL database for the ballot of ticket distribution. Looking back It was an incredibly exciting period that would lead on into more memorable nights in the company on the ensuing 1995/96 world tour. Where to start? I mean, how do you begin to describe it all . . . The shivers down the spine when they did Rain Song with an orchestra . , . Robert’s dedication to Bonzo before Four Sticks on Thursday . 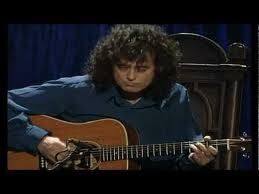 . . the spontaneous applause for Jimmy’s solo on Friday’s version of Since I’ve Been Loving You . . . The running good natured banter between Robert and the audience throughout the event . . . the emotional intensity of the new Wonderful One . . . the last five minutes of Kashmir on Friday which was as good a section of live music I’ve been privileged to watch in my entire life .. . So many highlights … so many disbelieving highlights at that. A clear seven days after it all, my mind is still reeling. Did it really happen? I mean, I’ve dreamed it enough times. But incredibly it DID happen. And what happened proved to be entirely in keeping with the legacy of what Led Zeppelin represented. To backtrack on to all then: The weeks and days leading up to the timing had been pretty fraught tor me in being given some of the responsibility for assisting with the distribution of invitations. It was a responsibility I was more than happy to take on but the inevitable consequences of dealing with countless calls and demands surrounding the arrangements did prove to be a heavy burden to carry. Never before did the phrase “You can’t please all of the people all of the time” have such relevance. As somebody close to it all remarked to me – you can only get twelve to a dozen and there was always going to be disappointed fans by the size of the proceedings who were not going to be lucky on this occasion. Hearing such disappointments first hand was, understandably, not always pleasant. My own personal arrangements to free myself to attend were somewhat rushed and flawed and it was only travelling down on the train on Thursday morning that I began to contemplate the enormity of what was happening. The summary of events thus far had run like this: Jimmy Page and Robert Plant had taken most of August to film the long-mooted MTV project, the end results of which would appear as an MTV Unplugged special in October. Location trips to Marrakesh and Wales would now be rounded off with two live performances before an invited audience at a secret London location set for the nights of August 25/26. Feedback from those close to the project had been very positive. The filming in Marrakesh had gone very smoothly with the airing of three new songs – two untitled and one dubbed City Don’t Cry. In Wales, despite the rain they had managed to film some excellent footage with When The Levee Breaks proving particularly inspiring. A dress rehearsal for the London shows on Wednesday had also gone remarkably well, according to those in attendance. Confirmation of the deployment of a full orchestra and an Egyptian string and drum section certainly whetted my appetite it all sounded almost surreal. A few hours from now it would be a reality. Thursday August 25 ,1994 – Festival Pier 5 pm: The pic here is a rather weary looking me plus Gary , Terry and Kam. This was the meeting point at which invited fans were advised to attend. From here we would be escorted to the location. Amongst the excited and expectant bunch of diehards I recognise and greet many familiar faces. An MTV official duly appears to take us to the nearby London TV studios – formerly LWT studios and home still for countless light entertainment TV recordings. Paul McKenna’s Hypnotism show is one such recording for tonight. An orderly queue awaits entry. “Hope Jimmy doesn’t get called in to appear or he’ll end up an Elvis impersonator”, shouts one wag – aware of McKenna’s penchant for ridiculing his contestants to imagine all sort of crazy roles while under his influence. I remember Paul McKenna myself when he was the morning DJ on the local Beds, station, Chiltern. In fact I used to do a weekly phone-in spot with him in my then role as local pop/rock informant. How strange our paths are crossing a decade later In somewhat surprising circumstances. The other queue with their minds on more important matters are now being ushered into the studios by the mostly American imported MTV staff. Amongst them are 50 MTV/radio station competition winners flown all expenses paid from the US. They line up excitedly amongst the TBL fraternity and other lucky fans. The waiting in the corridor is long – predictably – but we warm ourselves to such ordeals by recalling the overnight wait at the first Knebworth. We’ve all waited longer for less – no gate-crashing tonight, though. The security is very tight – with everybody subjected to a metal detector test for obvious reasons. Around 7.45 we are finally allowed access to Studio 2. Interestingly enough the billing for tonight’s show on the ticket is “An Evening With Page And Plant”. 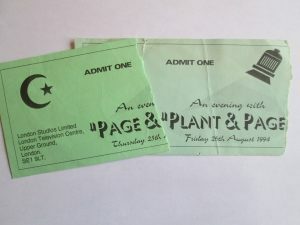 Friday’s reads: “Plant and Page”… and the laminated passes have Page Plant at the top .. . and Plant Page at the bottom – a subtle method of solving the potential who gets top billing wrangle. everyone is in Block AA because that’s all there is room for – providing an excellent view from all parts of the studio. Above the mixing desk there’s a VIP gallery and already the Plant contingent are present – Logan, Maureen and a pregnant Carmen (no granddad jokes please!). Jason Bonham is also there. A blues album plays inoffensively over the PA: boom cameras glide above us in readiness for what is about to be captured. Around ten to eight, Alex the MTV co¬ordinator does some cheer leading warm ups. “Let’s hear it for Rex King!’ shouts Alex and an appropriate cheer goes up for the long term Plant/Page aide who is marching around the stage checking last minute details – an appreciative cheer for the man responsible for many of us being here tonight. Minutes later, with the camera angles tested and the subtle lighting set, a short no-nonsense announcement precedes what we’ve waited for fourteen years to hear. 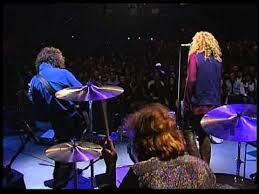 “Please welcome Robert Plant and Jimmy Page’ . . . and it’s a thunderous welcome. Robert Plant strides on to the stage from the left followed by Charlie Jones and Michael Lee .. . Jimmy enters from behind a black curtain on the right, immediately taking off his suit jacket to reveal a Knebworth style blue shirt. Robert and Jimmy . . . it’s taken so long. Of course there have been glimpses of them re-united – in particular the spirited spring ’88 jam at Hammersmith, and the Wearing And Tearing nutmeg at Knebworth 90. Separately not all has gone entirely well. Jimmy’s road to Studio 2 has been often turbulent – early ’80s drug busts, low key ramblings with Harper, the mismatch of The Firm, a fine attempt at winning back the audience with The Outrider project, and then, against all odds, the bizarre link with David Coverdale – the catalyst that certainly inspired his best post-Zepp playing. It could be viewed that such inconsistencies have only heightened the adoration within which he is held by the faithful. Mention of Page’s name anywhere and it’s instant legacy time. Still. And such is his fragile demeanour we seem to take a very motherly and protective view of our James Patrick. Knowing he can be brilliant and erratic in his performance within minutes of any given time is all part of the near masochistic pleasure in following his career. What we can never forget is, in the studio and on stage, Jimmy Page was the sonic architect (to use a rare warranted Coverdalism) of Led Zeppelin. His ability to create the perfect mood for the group (witness the remastering of the catalogue) was and never is in doubt. He was the true sound chaser – and it’s a title he still carries with much reverence. His ever onward stance in adding to the effects of his self-styled guitar army is also a major attraction for his countless admirers. 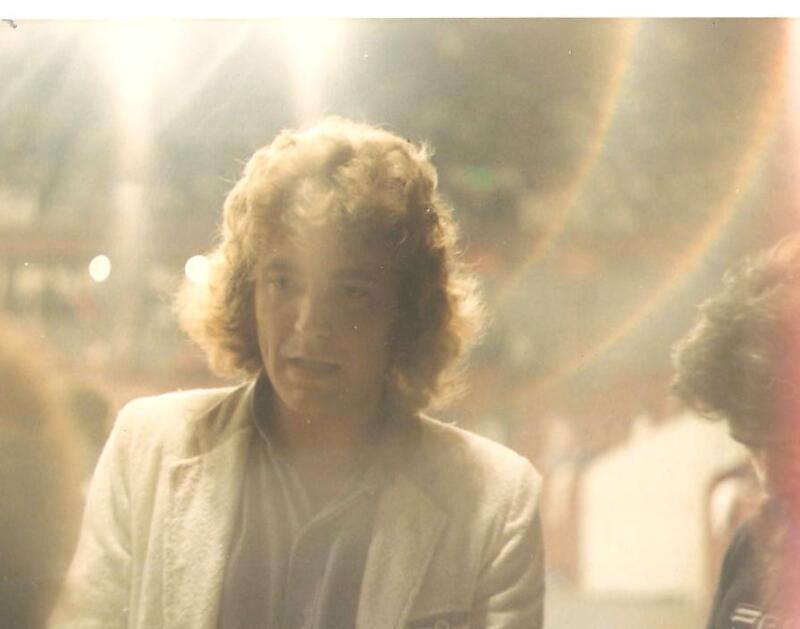 Think of Jimmy and my most immediate mind picture will be that of him back in Earls Court 1975, flashing that cherubic smile as he emerged from the dry ice on May 24 to layer on that most exquisite solos during No Quarter. Never as high profile as Robert in the past decade, any sighting is a moment to behold. Tonight’s is doubly so as he reunites with his old sparring partner. And the first thing I notice as he turns around to greet the audience is that familiar cherubic Page smile. He looks in excellent shape – and I d had my doubts after the Buxton show where he was carrying an uneasy amount of excess weight. No evidence of it now – he looks well fit with his hair jet blacked, permed and still with that side parting falling over one eye, ala 1969. Twenty-five years on he is still the quintessential English guitar hero. It’s sheer delight to be in his company again. And the same goes for Robert Plant. Striding on stage with that angular bounce of his, crooked smile beneath the now customary retro shag pile hair, tonight given something of a new look by being parted to the side, brown leather trousers, overlong long-sleeved Indian top, waistcoat, he looks suitably regal and better than I remember from last year. My, this is all a long way from the jumpsuits and bouffoned hair of 1983 – The Tube. Big Log and all that. A different era. Who could have predicted today’s events back then? over the past decade, but never less than Interesting. There have been some very odd phases, and some wild accusations and contradictions in his media statements, leading to him eating a sizeable proportion of his words on more than one occasion. But with Robert Plant what you get is what you get. And vocally he has matured like vintage wine. Last year’s Fate Of Nations album and tour was easily his most satisfying work in the post-Zepp period. His vocal prowess has if anything improved in recent years. Careful consideration in looking after this most precious instrument has paid off. And perhaps the organic nature of the material, preserved on that album, led him to realise the potential there was for this opportunity to rework some of his finest compositions in the company of his former musical inspiration. And that’s how it’s turned out. Six months down the line maybe something of the affinity that he felt for Jimmy when they were ensconced in that cottage way back when has returned to the fore. “He is the Paganini of the electric guitar – he’s brilliant”. That’s one of the best compliments I heard Robert pay Jimmy on MTV in the mid-’80s. A decade on, here he is linked with the station and in collaboration with the master. I can forgive him anything for making this decision – beatbox Heaven Knows remixes, that female walk-on part in Too Loud at the NEC, miming on TV, pretentious videos, you name it. Above any solo career moves Robert Plant will always be best known as the voice of Led Zeppelin. It’s a role model he has not always carried easily over the past decade. Tonight, as he strides up to the mike (“one solitary mike and we all know who that’s for* – how I remember writing that statement after Knebworth), I get the feeling he has prepared himself very carefully to carry that status and use its power to happily reconcile the past with the present. Never before has the legacy of what Led Zeppelin represented rested so contentedly on his shoulders. Looking slightly nervous but ready to do what’s got to be done, they briefly confer in the centre of the stage like newly-weds after signing the register. For this particular re-marriage the ceremony is about to begin. “Good Evening . .. Let’s get, er, plugged in then” remarks Robert, tongue in cheek and immediately debunking the idea that this will be the familiar Unplugged arrangement. Jimmy straps on the cherry red Gibson and picks out the welcoming chords of Thank You, a tentative run through delivered in the arrangement employed on last year’s Fate Of Nations tour. Jimmy switches to the Gibson 58 prior to his ex-partner uttering the words “and if I say to you tomorrow” right next to him. You have to go back twenty two years for the last time such words were spoken on stage within the vicinity of the pair. 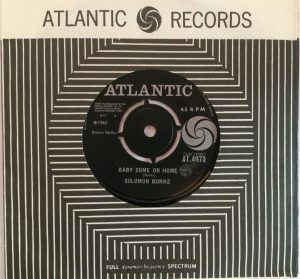 What Is And What Should Never Be is a much welcomed if slightly flawed second number – Jimmy being particularly hesitant on the solo. 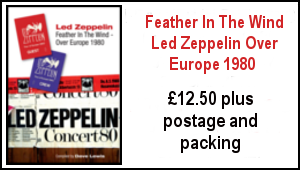 It warms up towards the end as Jimmy scrubs across the strings for that familiar stereo panned Zepp 2 trademark. Initial thoughts so far: They are understandably nervous and you get the feeling these two early run thoughts are mere warm ups. The sound however is absolutely crystal and the whole atmosphere of the studio feels like you’re almost in their backyard – privy to the best garden party you could wish to enjoy. For the next song it gets rather interesting. Jimmy settles into his chair (the regal looking upright backed affair used on the Coverdale Page Japan tour and the Take Me video) and straps on an Andy Manson three necked guitar. This I haven’t seen before. Robert introduces Nigel Eaton on hurdy-gurdy, James Sutherland on Bodhran percussion and Pori Thompson on acoustic guitar, and welcomes to the far left of the stage an Indian female vocalist, Najma Akhtar. .. who will sing the duet parts with him. For this is Battle Of Evermore 1994. It’s a joy to hear Jimmy picking out the melody against the whirring Hurdy-gurdy and the interplay between Robert and Nashma is very effective. Towards the close they add a new coda refraining an “ah-a ah-a” sequence, ala Achilles. Never an easy number to project live back in ’77, this arrangement is the first fruits of the ambitious extended Plant Page alliance. And it work supremely well. “From here to Balies’s is not that far” jokes Robert in a reference to the cabaret circuit they have so far avoided. The same line-up (minus Najma) stays on for Gallows Pole. Long rumoured to be part of the new set, I Ve been really looking toward to this and there is no disappointment. Jimmy strums over the 12 and 6 stringed Ovation double neck, Charlie provides a steadfast bass anchor to the intricate arrangement, Pori handles the banjo parts and Michael Lee storms in, as the pace builds. This is the first display from the drummer that confirms once again his ability to bring just the right amount of dynamics to the rhythm section, striking the drums in a very Bonham-like manner that adds to the whole atmosphere. As the song speeds to a climax Robert really lets go, losing himself in the “Keep a-swinging” repeat refrain before it all dramatically stops. “We’ll be back in a while” informs the singer, signalling end of part one. As the lights go up we excitedly exchange views. Everybody has been knocked out with the last two numbers and are similarly agreed that the opening pair of Zepp 2 standards had been merely a warm up. But, of course, we really haven’t seen anything yet. perhaps to the surroundings of Henry Wood’s Promenade Concerts but ensconced tonight to provide accompaniment to what we might have described in 1969 as the Pop Proms. The orchestra is led by Ed Shearmur who performs on Hammond organ. Jimmy and Robert reappear with Charlie and Michael. Charlie dons a huge double bass as the principal pair settle down, seated at the centre of the stage. “Perhaps this is how we should have done this song originally, all those years ago”, announces Robert. What happens next sends the biggest shiver down my spine since 1980. Jimmy picks out on acoustic guitar the intro of Rain Song. Hang on – I think I’ll write that line again, just to make sure it really did happen. Jimmy picks out on acoustic guitar the intro of Rain Song. Robert comes in with the first verse and then the orchestra majestically glides in to replace the melletron parts of the studio version. This is quite breath-taking. Robert sings the lyrics beautifully and Jimmy plays like mint, fingerpicking in all the right places. As the song beefs up, Michael comes in with suitably dynamic tom-tom injections (early on in the song he’d employed the brushes, adding yet more Bonham authenticity). It’s left to Jimmy to close proceedings with that lilting sequence which he carries of, perfectly. in hand and Jimmy’s solo is a crescendo of notes, the like of which we haven’t heard for many a long year. This is almost Led Zeppelin in all but name and the spirit is alive and kicking. Compellingly so. Proceedings take yet another slant when Robert offers stage right to the arrival of the Egyptian string and drum section, led by Hossam Ramzy who is handed the mike to personally introduce the boys in the band. He develops an instant rapport with the audience as he runs through the team sheet and causes much amusement when humorously he gets a plug in for his brother s Indian restaurant. “I think we should dedicate this to the original drummer with Four Sticks” says Robert, to rapturous cheers. An ambitious arrangement of Four Sticks follows with Michael tearing along with two stick in hand – a lovely tribute. To hear this long lost nugget in a totally new arrangement is another highlight, with Robert accurately interpreting, in a slightly lower register, every nuance and phrase of the original lyric. Jimmy again derives the riff on acoustic guitar and it all speeds up to a compelling climax as the three sections (European strings/ band/Egyptian strings) compete for authority. Robert asks Jimmy to introduce the next number and in usual fashion he humbly greets the audience before handing over to the Egyptian section to move into a lengthy intro. This is shades of Bombay orchestra ’72 -and those familiar with the Bombay CG CD will know how the 94 attempt at Friends sounds, with Jimmy awaiting the call to strum out the familiar riff. This is a little unsettled in tempo early on but unravels successfully enough by the second verse. If Friends appeared just a trifle laboured, the next number wipes out any minor misgivings completely. Robert duly gets into a lengthy and revealing speech regarding this new alliance and their desire to look back and revisit some past glories. And they don’t come any more glorious than Kashmir. This is no mere Atlantic-like stroll through. The Pride Of Led Zeppelin is radically reworked for the ’90s, opening with Robert singing the first verse in a slow tempo, accompanied by Jimmy on the Trans Performance Gibson, creating a phased gizmo effect on the pedals. This merges into the Hossum percussion of the East -and then on into the familiar and invigoratingly performed riff and they’re off on that road to tan tan again. What makes this exercise so fulfilling is the interplay between band and orchestra – on numerous occasions Jimmy and Robert halt the band performance and glance over to the Egyptian players who take it all into a different time zone. The finger cymbal player merrily jigs around to the riff, much to Jimmy’s amusement. As we get to the fade and the “Let me take you there” refrains, the whole thing speeds up into a truly memorable climax which sees Jimmy playing a rumbling, Achilles-like, riff off against Michael Lee s stop-start drumming. In turn they pass the riff over to the Moroccan brass and string players, formulating a call and response sequence that threatens to take the roof oft. It the TV cameras have got the right angles, this will look sensational on screen. With that number successfully captured, they leave the stage together, smiling and waving as they go. That appears to be the end -particularly when the background blues music strikes up again. Bill Curbishley himself signifies otherwise as he rushes up to the mixing desk. “Fade that, they’re coming back on again” he demands. Minutes later they appear from behind the black curtain at the side of the stage and make their way on stage again. 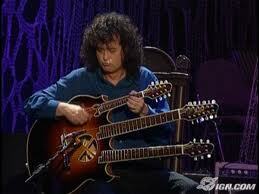 Jimmy straps on the Ovation double neck. Robert makes another little speech. “This was written on the side of a Welsh mountain in a cottage, about half an hour before the young lady furiously taking pictures in front of me was conceived” (a reference to Scarlet in the front row). “Was I there? Possibly!” laughs the man, with Jimmy grinning behind. “See, we’re happy again!” – a memorable statement which the entire audience would certainly endorse. A lovely lilting laid back arrangement of That’s The Way follows with Michael Lee adding a new drum accompaniment and Pori taking up the banjo. Robert picks up the tambourine and strikes up that classic pose – a pose I’d long since give up ever seeing again. Jimmy meanwhile rocks back and forth as he strums out the chords to a song that was last performed live by the pair nigh on twenty years ago. Smiles, handshakes, cheers, waves goodbye and it’s all over. “Thanks for coming along – hope to see you tomorrow” says the man from MTV. The crowd begin to filter out, still disbelieving at some of the events that have appeared before their very eyes. “That really was something” an excited Aussie, Peter, tells me near the stage. Scarlet’s there too, beaming with the pride ot her father’s performance. Predictably there’s a buzz in the air as we disperse – a buzz so strong you can almost touch it. It recalls to mind the afterglow present as we all deserted the Knebworth site after the first night, fifteen years back. It’s a buzz that signifies that tonight has been another very special night – a night that truly encapsulated the affinity Robert Plant, Jimmy Page and its audience still has for the music of Led Zeppelin. An excellent read and in my totally biased opinion, one of the best ever articles to appear in RC. I could disagree with one or two of the gig choices (but I won’t) and a couple of the bootleg choices but overall, an excellent presentation and if we get expanded entries of what is featured here in the forthcoming ‘Evenings with…’ book the the world will feel a slightly better place all round. Thanks Mr L.and T! Friday treats at the Vinyl Barn –at the always excellent Vinyl Barn last Friday morning, I was well pleased to find an Italian pressing of Led Zeppelin III in a non wheel sleeve -plus it had to be Aretha and I snapped up her very fine Let Me In Your Life 1974 album on Atlantic featuring Donny Hathaway, Bob James, Cissy Houston and more…thanks Darren. It was great to meet up with my childhood friend Dave Corp last week. In the 1960s Dave lived a few doors down from me in Dents Road. We first met when I was 6 and he was 7. Back in 1964 we were both mad keen pop music fans -Dave was a Gerry and the Pacemakers fan and I loved The Dave Clark Five. We set up some old tin cans in my back garden and used them as drums and replicated the hits of the day – it was my first inkling that I wanted to play the drums. 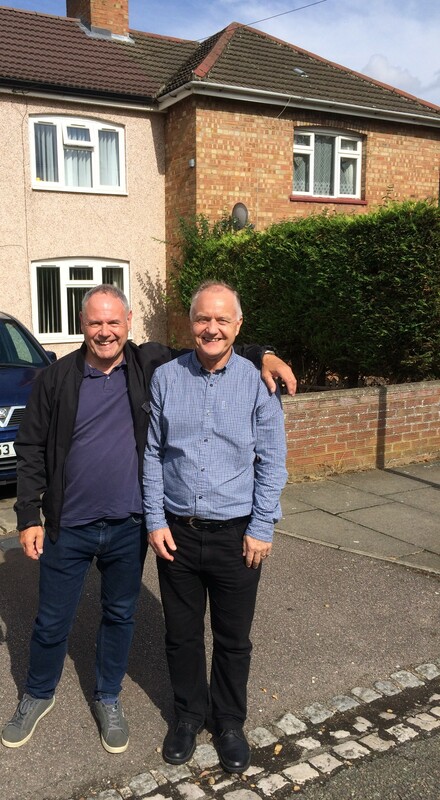 Some 55 years later, last Thursday we walked down Dents Road again – it was a hugely nostalgic trip for us both – here we are outside where Dave lived at number 4,I was three doors down at 52. In 1970 we went to see Chelsea (Dave’s faves) against Manchester United at Stamford Bridge – footage of that is on YouTube and you can see us in the crowd in this pic. 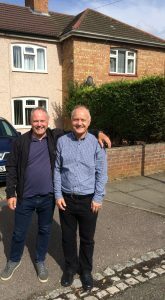 We try and meet up once a year -it was a delightful afternoon where the importance of where we came from and our childhood roots was more than apparent… it was good to take stock of all that as we both near our birthdays – Dave is 63 this week and me 62 in a couple of weeks time. Elsewhere,there’s been more work here on the forthcoming TBL issue 44. 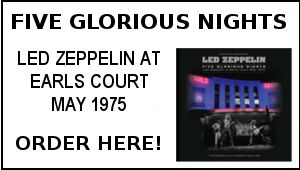 I am aiming at a November publication and there’s some great stuff lined up, including an illuminating interview with Mark Blake, the author of the forthcoming book Bring it One Home, Andy Crofts’ tape analysis of the 1972 US tour and Paul Sheppard’s overview of the Led Zep studio outtakes bootleg catalogue. 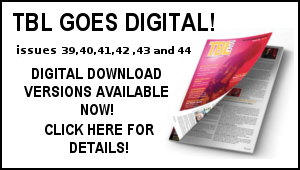 I’ll be announcing details of the TBL subscription for this issue shortly. More on all this as it unfolds. August is always something of a preparatory month for the busy Autumn schedule ahead. To that end, I’ve been eyeing up plans for the September 30 TBL 50th Anniversary Gathering at the Atlas pub in Fulham, the John Bonham Celebration concert in Redditch the week before plus promo work on the forthcoming publication of the Evenings With Led Zeppelin as written by Mike Trmaglio and myself. This is due out September 27. Add in the September 8 Victoria Record Fair and a couple of important Birthdays in the next couple of weeks (that’s the good lady Janet’s on August 31 and mine on September 5 ) well, to say it’s going to be a busy few weeks is something of an understament. Still, it’s not every year that the opportunity to celebrate the 50th anniversary of the formation of Led Zeppelin comes along. 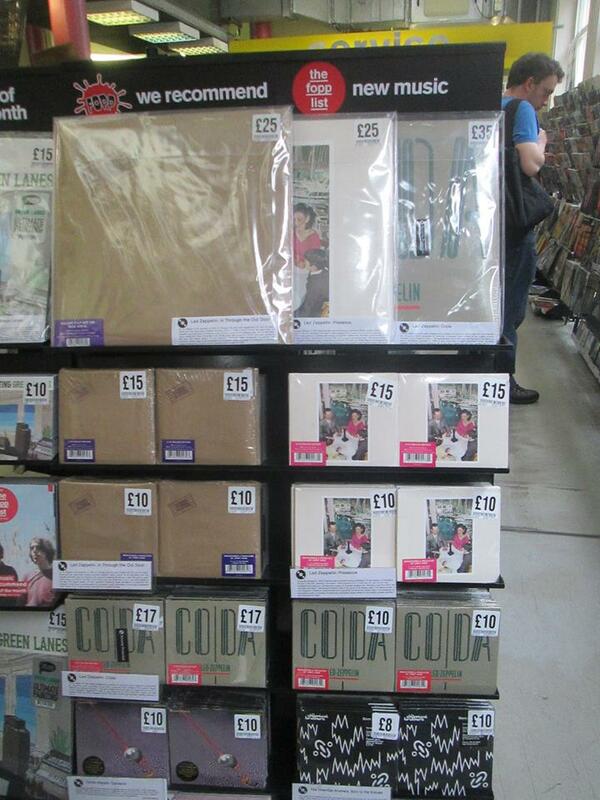 Here’s a round up of a few of the aforementioned vinyl beauties: These, and a few more albums, singles and CDs will be on the player here over this Bank Holiday weekend. 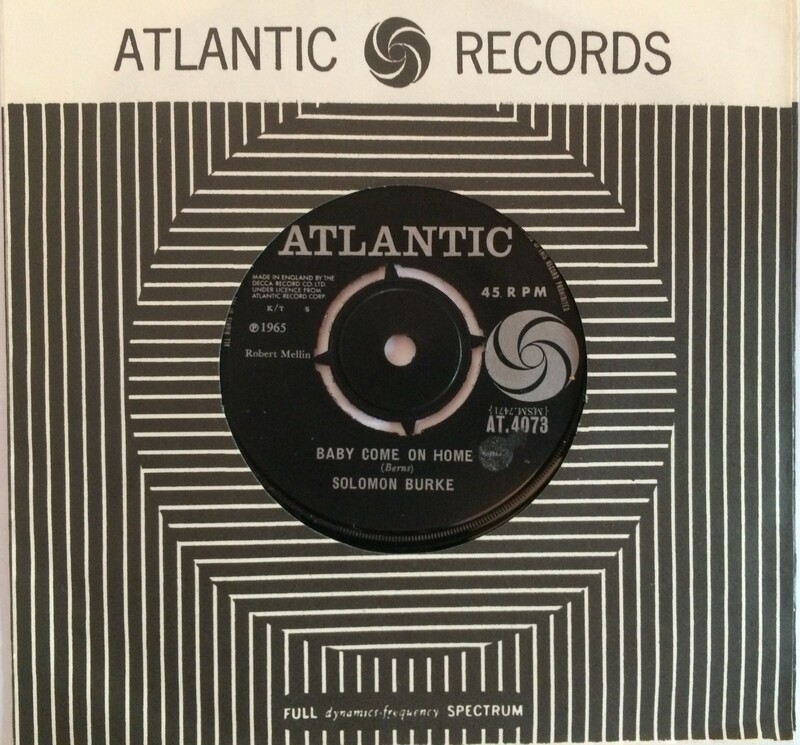 2: Baby Come On Home – Solomon Burke (Atlantic) – original version of the Bert Burns song Led Zep adapted and recorded in October 1968 but did not release until the Boxed Set 2 in 1993. 3: Sandie Shaw – Wight Is Wight (Pye) – 197o single – a lovely period piece which references Dylan and Donavan and the famous festivals. 4: The Days of Pearly Spencer – David McWilliam (Parlophone) – the swirling sound of English psychedelia from 1967. 5: In The Morning – Nina Simone (RCA) – superb version of the Bee Gees song featured in the 1971 film Melody – one of my all time fave films. 6: Jeepster/Lifes A Gas – T.Rex (Ariola) – picture sleeve German release -very nice. 7: Fireball XLF – Barry Gray (Melodisc) – from the classic 1960s TV series Fireball XLF. 8: Hey Jude – Wilson Pickett (Atlantic) – kicking off a trio of Beatles cover versions (one of my record collecting pursuits) – Duane Allman’s guitar work is exemplary. 9: Rain – Hard Meat (Island) – very obscure 1969 cover of The Beatles’ classic 1966 B side. 10: A Hard Days Night – Ramsey Lewis Trio (Chess) – a suitable jazzy interpretation of The Beatles’ 1964 single – the soundtrack to their first film. Great feedback as ever Larry! Many thanks! 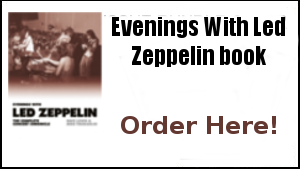 End of the 77 tour was an odd time for a Zep fan in the US…I had been thrilled to see them in May and as the (invaluable) tapes have shown since, they were certainly building momentum as the tour rolled on into the summer. Then the terrible news came about Karac and the remainder of the tour being canceled. The only media report in the States that I can recall was a piece in Rolling Stone titled if I’m remembering correctly “The Wrong Goodbye”. It was a strange and sad period and there was a lot of speculation that they were finished. Then came ITTOD, a criminally underrated record imo. Yes, it was a bit different, but all of their albums were different, which is one reason we’re still talking about and living with the music all these decades later. I loved it from the first spin on the old turntable. After the unsettling and hypnotic intro to In The Evening, Robert’s startling yell sent me thru the ceiling! A great rocker. Fool In The Rain, a great piece by the entire band, and Jimmy’s excellent and inventive solo is one of my favorite Page moments. Carouselambra is a monster, and the reissue of a couple of years back really does the piece (and the entire album as well) some new and well-deserved justice. Oddly enough, I seem to favor the version I downloaded from itunes. All My Love is one of the true classics and I’m Gonna Crawl was a great (although unintended) finale to such an unforgettable era and album catalog. And the drumming of John Henry Bonham was brilliant throughout the album. Unledded…loved it at the time of the album release and MTV airing, although I have to say some of it hasn’t aged that well for me. The snubbing of John Paul Jones irritated me then and irritates me now. That said, I watched the MTV film of it with great anticipation…I enjoyed Thank You, Evermore with the stunning vocal of Najma Akhtar, Gallows Pole and Four Sticks driven by the late great Michael Lee (he did Bonzo proud), Yallah (loved the performance and setting), and of course the epic finale of Kashmir. All that said, when I’ve listened to it in more recent times I find some of it a bit flat (I also feel that way about Clarksdale, but that’s more due to the very uninspired production of the album). The tour was terrific and I will never forget seeing them at the old Capital Centre, by then called “US Air Arena”, in Landover, Maryland in March of 1995. The first night, when they stopped playing after the opening few song barrage, the passionate, heartfelt and sustained ROAR that came from the crowd was something I will never forget. It probably happened at every show, but it was such an amazing moment and Jimmy and Robert were grinning and waving at the crowd and they seemed to appreciate the love that the fans were showing them. I saw quite a few shows on that tour and while some “sameness” crept in, especially on the long Kashmir, I wouldn’t trade a moment of it. Congrats on the Record Collector feature Dave and looking forward to reading it! Great piece as usual Dave. Loved the ’79 excitement and promise of things to come, you could really feel the enthusiasm come through from Robert and John in your article, as you unfortunately said “What could possibly go wrong”. In through the out door on the turntable as we speak. Thanks as ever for what you do. Love to the family.